Just to the south of the Britain farms. History: The Clan of the Blue Dragons had the fortune of being able to aquire land just outside of Britain. 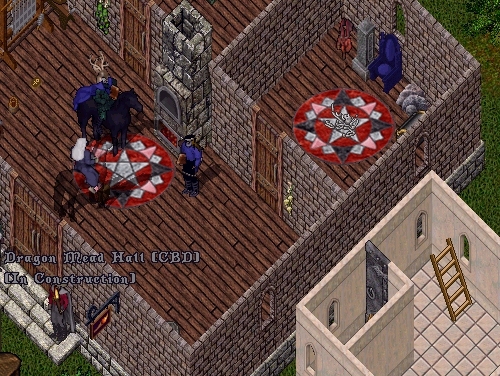 Still in its infancy, the CBD Village looks to be a promising addition to the realm. The place isnt that hard to find. If you go to the mountain pass, its just to the south. Still in the in the early of developement, the CBD village looks to host upcoming events for adventurers to participate in. Each house will have a theme and will add something unique to the village itself. Examples are that of a a library which contains a lot of books from all over the lands, a training house, and a town meeting hall named the Dragon Mead Hall. After having the opportunity to go out there and meet some of the locals, this place will be a welcomed site to those who are looking to find adventure, talk adventure, and go adventure. I cant wait to see how this place developes. 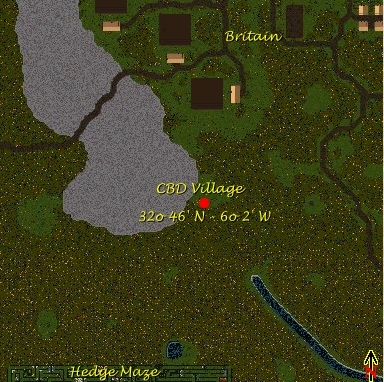 CBD Village also claims to have the most extensive rune library in Trammel. Something anyone could and should use should they want to go anywhere in the lands.